ASUSTOR is one of the leading innovators and manufacturers of network attached storage (NAS) devices. In addition to advanced hardware, increased reliability and speed, cross-platform file access, flexible capacity expansion, and convenient system migration features, ASUSTOR NAS servers are highly energy-efficient and allow saving on power costs. With ASUSTOR NAS servers, you can also build a multifunctional, high-performance and reliable VM backup appliance. With such an appliance, you can separate VM backups from your infrastructure to free up resources and quickly restore data in case your infrastructure goes down. To create a VM backup appliance, all you need to do is install specialized software directly on an ASUSTOR NAS. 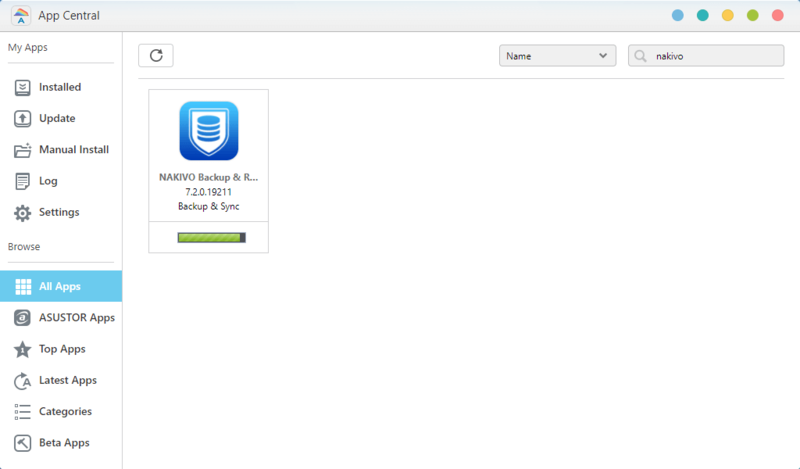 NAKIVO Backup & Replication is a perfect option in this case. 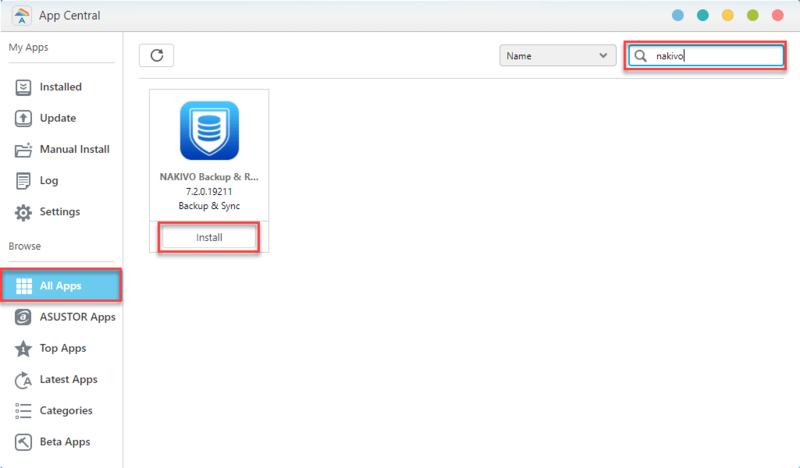 NOTE: Prior to installing NAKIVO Backup & Replication on a NAS, make sure that your ASUSTOR NAS model is supported. Open the ASUSTOR Desktop in your browser by entering the IP address of your ASUSTOR NAS. Click the App Central application icon. Click All Apps in the side menu of the App Central window. 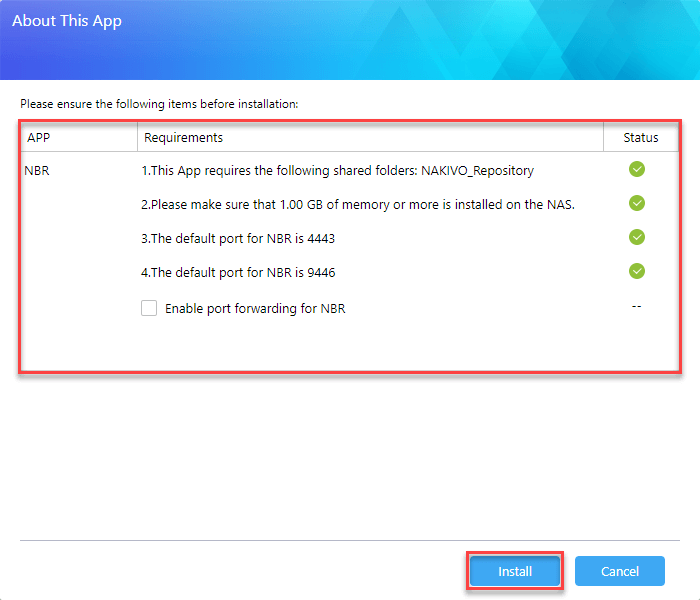 Search for NAKIVO Backup & Replication, and when the application is found, click Install. Check the information about the application and click Install. Installation of NAKIVO Backup & Replication will begin shortly, and the installation progress will be shown on the progress bar. When the installation process is completed, NAKIVO Backup & Replication will be displayed as an installed application and ready to use. Compress unique data blocks for further reduction of the size of backups to be stored. NAKIVO Backup & Replication installed on your ASUSTOR NAS has the built-in features that help increase VM backup speed: Forever-incremental Backup, Changed Block Tracking (CBT) and Resilient Change Tracking (RCT), Network Acceleration, Skip Swap Files and Partitions, and LAN-free Data Transfer. All of the data protection features of NAKIVO Backup & Replication are available for the ASUSTOR NAS-based VM backup appliance, help protect your VMware and Hyper-V environments against all types of disasters, and allow for the near-instant recovery of your VMware and Hyper-V VMs. NAKIVO Backup & Replication installed on your ASUSTOR NAS has all necessary means to perform data recovery within seconds. So, you can instantly restore VMs, files, Microsoft Exchange objects, Microsoft SQL Server objects, and Microsoft Active Directory objects directly from compressed and deduplicated VM backups. 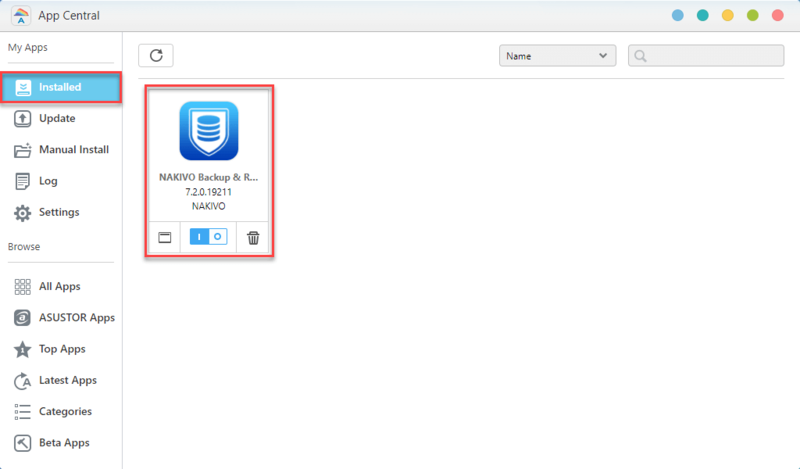 NAKIVO Backup & Replication can be installed on ASUSTOR NAS to create an all-in-one VM backup appliance. It is a wonderful solution for your business, as it efficiently increases data protection, reduces the load on your infrastructure, and facilitates the backup-and-restore process. The ASUSTOR NAS-based VM backup appliance increases the overall backup speed by up to 2X, and data recovery can be performed within seconds, enabling you to instantly restore VMs, files, and application objects. All this ensures reliable protection of your VMs running on VMware or Hyper-V and helps you manage business continuity in case of a disaster.